Brothers and Sisters . . . Part of being a leader is modelling. Modelling is the process of being and/or setting an example. The Apostle Paul said, "Be imitators of me, just as I also am of Christ." (1Corinthians 11:1). He was giving an example that those who are Christian leaders need to imitate Christ in order to set an example to be followed. In a famous Nike ad, NBA Hall-of-Famer Charles Barkley made headlines in 1993 by saying, "I'm not a role model... Just because I dunk a basketball doesn't mean I should raise your kids." Well, the problem is, we don't get to decide whetgher we're models or not. We just are. The best we can do is try to bethe best one's we can. So on my imaginary chalkboard I wrote down many things which I would like to and/or should model. I quickly ran out of room . . . But I started to think, "It's tough to lead where you haven't gone or to require things of others you don't require of yourself." 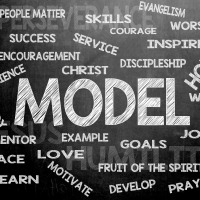 I have decided to model everything I want to lead or teach. I don't know how successful I will be, because I have so many deficits, but I'm going to try. I hope I am able to go where I believe God is pointing and be whom God is requiring.